Schattenbilder (Silhouettes) of Gustav Mahler conducting, by Otto Böhler (1847–1913), published posthumously in 1914. A very busy day today so I thought I’d just do a quick post to give you a chance to test your brains with some more order-of-magnitude physics problems. I like using these in classes because they get people thinking about the physics behind problems without getting too bogged down in or turned off by complicated mathematics. If there’s any information missing that you need to solve the problem, make an order-of-magnitude estimate! What is the maximum distance at which it could be possible for a car’s headlights to be resolved by the human eye? How much would a pendulum clock gain or lose (say which) in a week if moved from a warm room into a cold basement? What mass of cold water could be brought to the boil using the energy dissipated when a motor car is brought to rest from 100 km/h? How many visible photons are emitted by a 100W light bulb during its lifetime? There’s no prize involved, but feel free to post answers through the comments box. It would be helpful if you explained a bit about how you arrived at your answer! I read an interesting piece in Sunday’s Observer which is mainly about the challenges facing the modern sports betting industry but which also included some interesting historical snippets about the history of gambling. One thing that I didn’t know before reading this article was that it is generally accepted that the first ever bookmaker was a chap called Harry Ogden who started business in the late 18th century on Newmarket Heath. 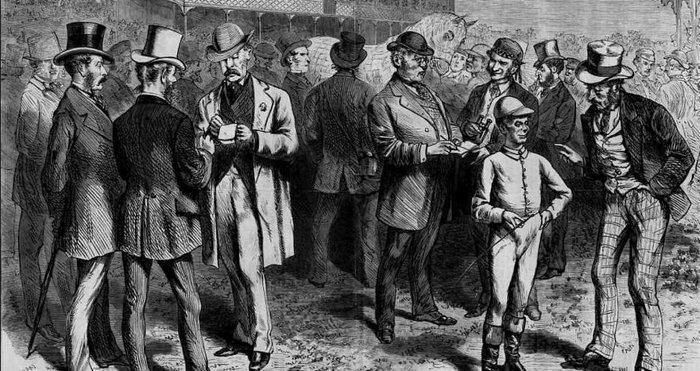 Organized horse-racing had been going on for over a century by then, and gambling had co-existed with it, not always legally. Before Harry Ogden, however, the types of wager were very different from what we have nowadays. For one thing bets would generally be offered on one particular horse (the Favourite), against the field. There being only two outcomes these were generally even-money bets, and the wagers were made between individuals rather than being administered by a `turf accountant’. Then up stepped Harry Ogden, who introduced the innovation of laying odds on every horse in a race. He set the odds based on his knowledge of the form of the different horses (i.e. on their results in previous races), using this data to estimate probabilities of success for each one. This kind of `book’, listing odds for all the runners in a race, rapidly became very popular and is still with us today. The way of specifying odds as fractions (e.g. 6/1 against, 7/1 on) derives from this period. Ogden wasn’t interested in merely facilitating other people’s wagers: he wanted to make a profit out of this process and the system he put in place to achieve this survives to this day. In particular he introduced a version of the overround, which works as follows. I’ll use a simple example from football rather than horse-racing because I was thinking about it the other day while I was looking at the bookies odds on relegation from the Premiership. Suppose there is a football match, which can result either in a HOME win, an AWAY win or a DRAW. Suppose the bookmaker’s expert analysts – modern bookmakers employ huge teams of these – judge the odds of these three outcomes to be: 1-1 (evens) on a HOME win, 2-1 against the DRAW and 5-1 against the AWAY win. The corresponding probabilities are: 1/2 for the HOME win, 1/3 for the DRAW and 1/6 for the AWAY win. Note that these add up to 100%, as they are meant to be probabilities and these are the only three possible outcomes. These are `true odds’. Offering these probabilities as odds to punters would not guarantee a return for the bookie, who would instead change the odds so they add up to more than 100%. In the case above the bookie’s odds might be: 4-6 for the HOME win; 6-4 for the DRAW and 4-1 against the AWAY win. The implied probabilities here are 3/5, 2/5 and 1/5 respectively, which adds up to 120%, not 100%. The excess is the overround or `bookmaker’s margin’ – in this case 20%. This is quite the opposite to the Dutch Book case I discussed here. Harry Ogden applied his method to horse races with many more possible outcomes, but the principle is the same: work out your best estimate of the true odds then apply your margin to calculate the odds offered to the punter. One thing this means is that you have to be careful f you want to estimate the probability of an event from a bookie’s odds. If they offer you even money then that does not mean they you have a 50-50 chance! I completely forgot to upload the slides from my talk at the Open Meeting of the Royal Astronomical Society on April 12 2019 so here they are now! Just a reminder that the centenary of the famous 1919 Eclipse Expeditions is on 29 May 2019. Here’s another interesting image that for some people creates an optical illusion in that the circular patterns seem to rotate. I have to admit, though, that I don’t see the effect. Actually, correct that. I don’t see anything when I view it on my phone, but do see swirling motion when I have it on my computer screen. Well here I am, back in Maynooth, after a week’s restful leave in Cardiff. The weather here is just as nice as it was in Wales when I left yesterday: sunny and about 20 degrees. I’m enjoying the warm weather very much indeed, as my arthritis seems to have eased off considerably. I was planning to return to Ireland today (Monday) but the flights were far cheaper yesterday. The plane I took yesterday (Sunday) less than half full. Incidentally, after their recent rescue and restructuring FlyBe have announced that after this summer they will no longer operate jets from Cardiff. Flights to Dublin will therefore be by their smaller Bombardier turboprops rather than the Embraer aircraft that I took yesterday. Today is a Bank holiday in Ireland, as it is in the UK, but after that the Easter break is over; I’m officially back to work tomorrow. 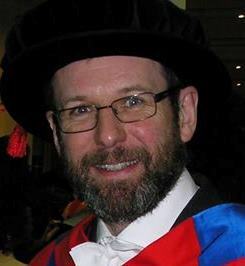 This semester will have been divided into three pieces, firstly by the half-term study week (around St Patrick’s Day) and now by a one-week Easter break. Last year these two breaks were contiguous, but Easter is quite late this year so they are separate this time. Anyway, we now have three weeks of teaching left followed by the May examination period and, of course, the inevitable Marking of the Scripts. The three remaining weeks include two Bank Holiday Mondays including today, Easter Monday, and the May Day Holiday on 6th May). I have lectures on Mondays I will miss two sessions, leaving only seven lectures remaining for Engineering Mathematics. I’d better make sure that in the short time remaining I cover everything that is in the examination! Anyway, although it’s a holiday I’ve got to get my lecture together for tomorrow morning so I’d better get to work. It’s a shame not to be out and about in the sunshine but there you go. That is the price you pay for having a week off. No doubt there is a ton of emails to reply to as well; I’ve tried not to look at my inbox while I’ve been off. I’ve made that a rule for holidays now: put the out of office message on and leave the email alone! At this time of year it seems appropriate to do a post, as the thoughts of good folk around the world turn to the important issue of the season … ie who will get relegated from the Premiership. Huddersfield and Fulham having already been doomed, the only question is who will join them. The bookies clearly think Cardiff City are odds-on to take the third relegation spot: the best odds I could get are 1/6 on them going down, implying only a probability of 14% or so survival. Brighton and Hove Albion are 9/2. Southampton are 150/1, Burnley 250/1 and Newcastle 750/1. I’m not so sure the odds on Cardiff City are fair: they do play Liverpool later today but after that seem to have two winnable games (against Fulham and Crystal Palace). Brighton are three points ahead of Cardiff, but that’s away against Spurs and they’ll do well to get anything out of that fixture, and after that they have games against Newcastle United, Arsenal and Manchester City. Despite yesterday’s 0-0 draw against Wolves they don’t look like a team strong on form and confidence.In short I think that 9/2 is worth a bet. Let me say that I don’t want to see either Brighton or Cardiff go down. I’ve got ties to both places. I’m just talking about what seems probable not what I think is desirable. Southampton seem to have extremely long odds too, but they do seem to have a much easier run in than Brighton. UPDATE: Cardiff City lost 2-0 at home to Liverpool this afternoon. The odds on them get relegated have shortened a bit (around 1/8 is as good as you can get) but there’s no great change in the odds, presumably because bookies did not really expect Cardiff to get any points from that game. Brighton have now moved to 13/2 against. Cardiff City are now on 31 points with three games left. That means the maximum total they can reach is 40, so Newcastle United are safe from relegation.